Tirschenreuth Porcelain Collector Plate, World of Wildlife Fund "Song Birds of Europe" Series Plate #2 by Ursula Band. Original Box and with the Certificate. Produced only in 1985-86. We also have Plate #1 available as well (see item P67). This is a lovely Collectors Plate in "The European Song Bird" Series by Ursula Band, produced by Tirschenreuth Porcelain, for the World Wildlife Fund. This is Plate #2 in the Series and is called "The Firecrest". Lovely Green Foliage, with (3) Birds sitting on a Branch, Beautiful Red Stripes on their Head, Brown Birds with White Throats. A wonderful addition to any Plate Collection.. Excellent condition, and in its original Box, and with the Certificate. 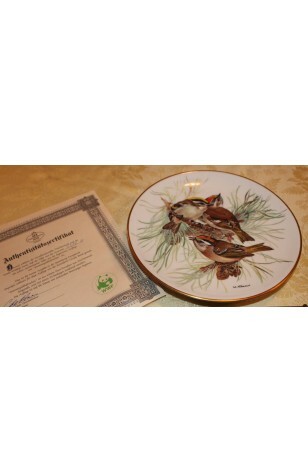 Tirschenreuth Porcelain Collector Plate, World of Wildlife Fund "Song Birds of Europe" Series Plate #2 by Ursula Band. Original Box and with Certificate. Produced only in 1985-86. We also have Plate #1 available as well (see item P67).